Sponsored elder Salvacion stands outside her home in Zambaoanga, Philippines. Throughout the year, Unbound’s communications liaisons interview dozens of people to help us share the stories of the people we serve. Sometimes, they meet someone who inspires them in unexpected ways. That’s what happened to Tristan John Cabrera, who is based out of an Unbound office in Quezon City, Philippines, when he visited 84-year-old sponsored elder Salvacion in Zamboanga. Salvacion has been sponsored by Stephanie from Louisiana for almost 16 years. On a recent visit to our program in Zamboanga, in the southern part of our country, I felt so touched by a particular elder from there. Her name is Salvacion, or “Lola (Grandma) Salvacion,” as they call her. Many residents of Zamboanga, including Salvacion, speak a Spanish-based language called Chavacano. Visiting the city, I heard, “Bienvenidos de Zamboanga,” which means welcome to Zamboanga. I don’t understand much of the Chavacano language, but since some residents also speak Filipino, which I speak, we can still communicate. Here in the Philippines, we are very caring toward our grandparents. We take care of them no matter how hard it is, most especially if the elder is bedridden or unable to walk anymore. I remember my “Lola” (grandmother) who took care of me when I was a child while my parents were working. I wasn’t able to take care of her when she was really weak because of her age, as I was only 7 years old. I wished I was old enough at that time to give my Lola all the best care that I could give. Salvacion lives in a small home made up of scrap materials that might collapse anytime. The pathway going to her house is flooded with thick mud, and I myself was actually hesitant to walk on it. She just wears her old boots and washes them out as she goes back and forth. According to her neighbor, who also happens to be a sponsored elder, Lola Salvacion is a strong woman. She lives independently. She doesn’t bother her neighbors just to ask for food or drinking water. They just check on her every morning to see if she is still OK, and sometimes they give her food. 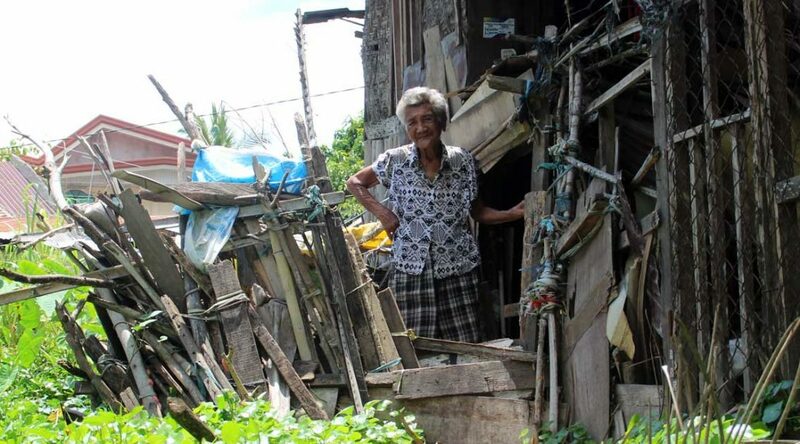 It must be really hard for Lola Salvacion to live alone in the area, especially considering her age. At 84, she can still walk, but you can see she is already struggling. Her voice is husky and dry, with teary eyes. I notice her back is already bending as she stands and walks. But seeing her without anyone who could hold her hands while walking is very painful for me. Everyone with me is looking at her as she walks in the mud, thinking she might fall. I am holding my camera because I want to show people how strong she is through the pictures and videos. As we go along in my interview, I ask her if she has one wish for Christmas, what would it be? She said it would be to eat chicken, either adobo chicken (a Filipino specialty with meat marinated in vinegar, soy sauce, garlic and other seasonings) or fried chicken. Do you know what comes to my mind? (And I know if you are in my position, you will do the same thing.) I decided to treat her to lunch, together with the program staff and our driver. It’s a surprise for her. Salvacion leads Unbound staff members along the path outside her home. Salvacion enjoys fried chicken from Jolibee, a popular fast-food restaurant in the Philippines. Sometimes there’s no need to ask too many questions because the answer is already there in your eyes. The way I look at her, I remember my grandmother and how she would do everything to take care of me while my parents were at work. 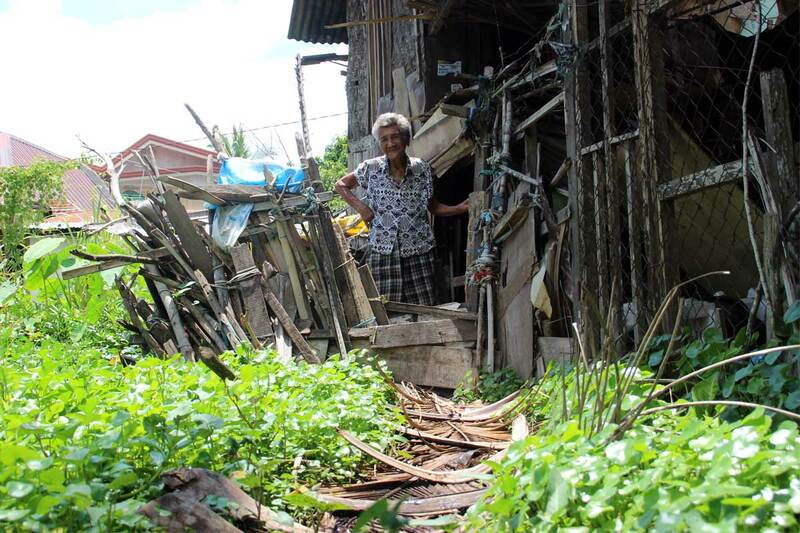 Lola Salvacion’s situation, living alone, is not common here in the Philippines. We really take care of our grandparents. We do everything we can to assist them until the end. I know Lola Salvacion she has already found a family through Unbound. Love of neighbor, love coming from staff and parent leaders, her sponsor and love coming from within. That’s what makes Lola Salvacion keep on going strong in whatever challenges she encounters. Let’s give love to our grandparents. They are also the reason why we are here in this world. They made a lot of history to secure our future right now. Give love to the grandparents of the world. Sponsor an elder today.